Learn how to use Spanish reflexive verbs and pronouns with this convenient downloadable lesson. 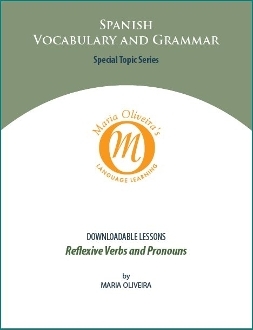 Review the rules of usage; learn how to conjugate the reflexive verbs and where to place the appropriate reflexive pronoun. This special topic lesson provides lots of practice with exercises and puzzles; the answers are in the back so you can check your progress. You will move closer to Spanish language proficiency when you master the finer points of grammar!